The Folk Hall in New Earswick was used both as a central place of worship and as a meeting place for all the societies and groups which the residents took part in. 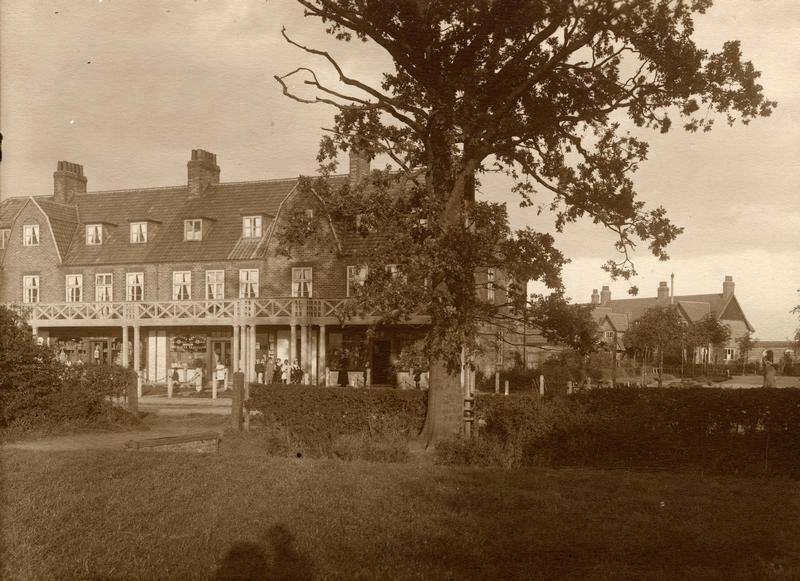 This picture shows the Girls Club and was probably taken in about 1917. 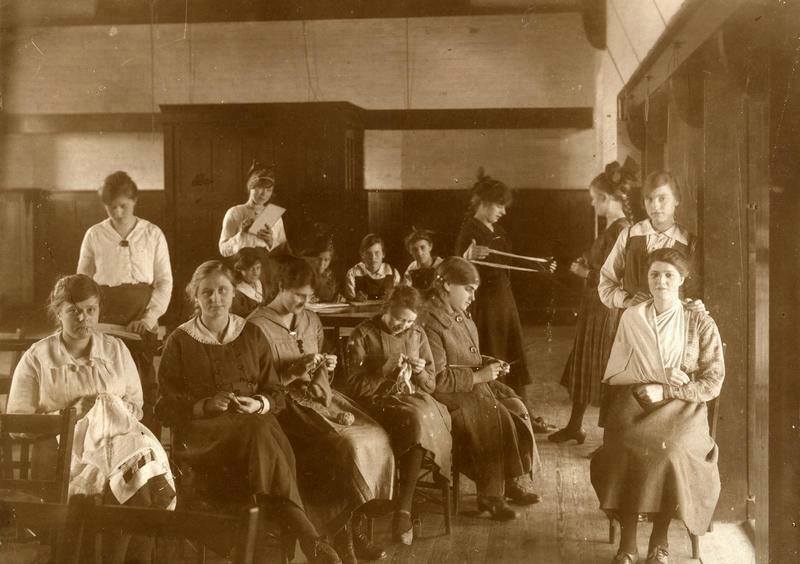 The young women are engaged in a vaiety of occupations including knitting, sewing, drawing and practicing first aid. At this time many such clubs were dominated by activities geared towards the support of the troops engaged in the First World War. 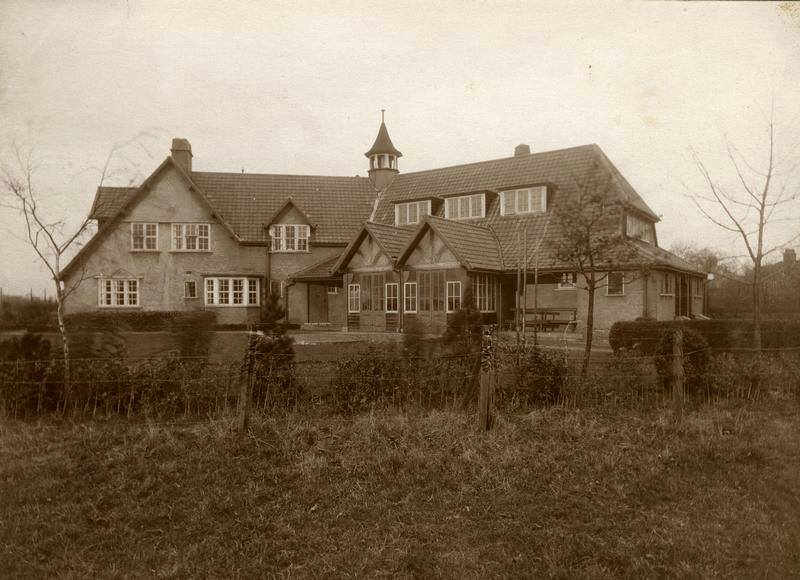 A number of social clubs and groups were based at the Folk Hall in New Earswick. 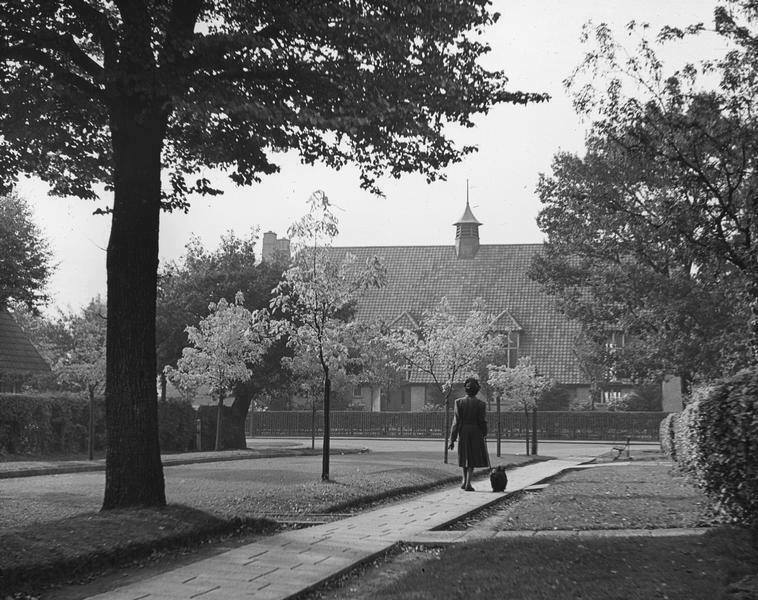 It was also used to continue the tradition of adult education which the Rowntrees were so committed to. 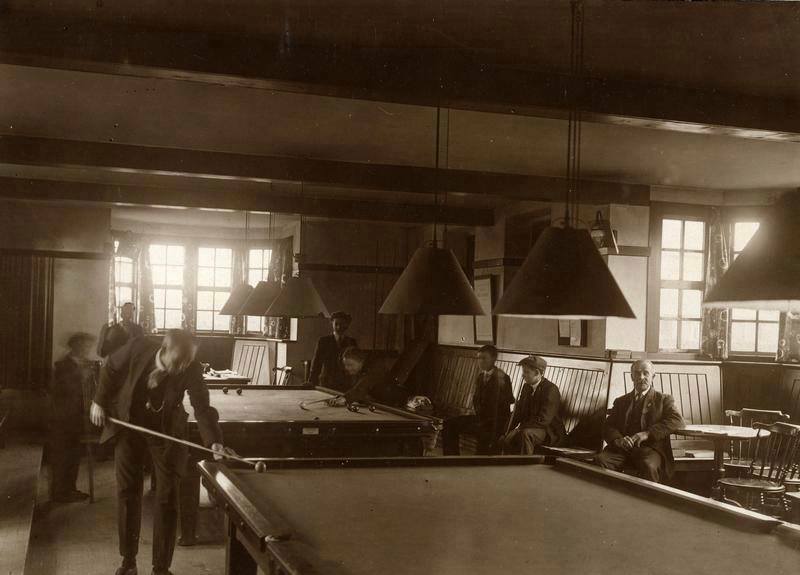 The societies were to reflect the interests of the residents as this group of men playing snooker illustrates. The shopping center in New Earswick is on Hawthorn Terrace. The first shop had been the Co-op which was built in Station Avenue in 1908 with the Post Office next door. 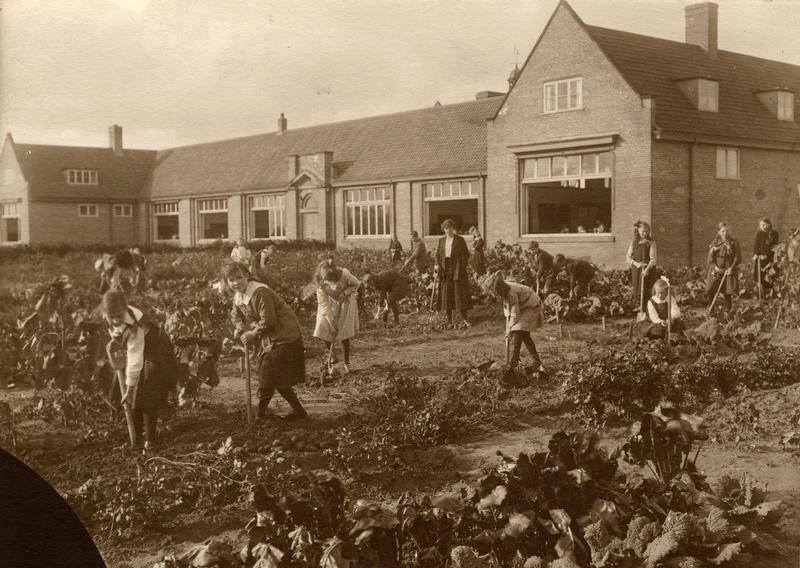 The gardening class was an important part of the studies for the children of New Earswick school. The value of nature study was also stressed and practiced throughout the school. This house on Hawthorn Terrace forms part of one of the terraces designed by Raymond Unwin to provide high quality rented accommodation for working families. The houses were planned with economy in mind which meant providing adequate living space whilst limiting the total floor space. This was a difficult juggling act whilst also providing three bedrooms and a low rent! 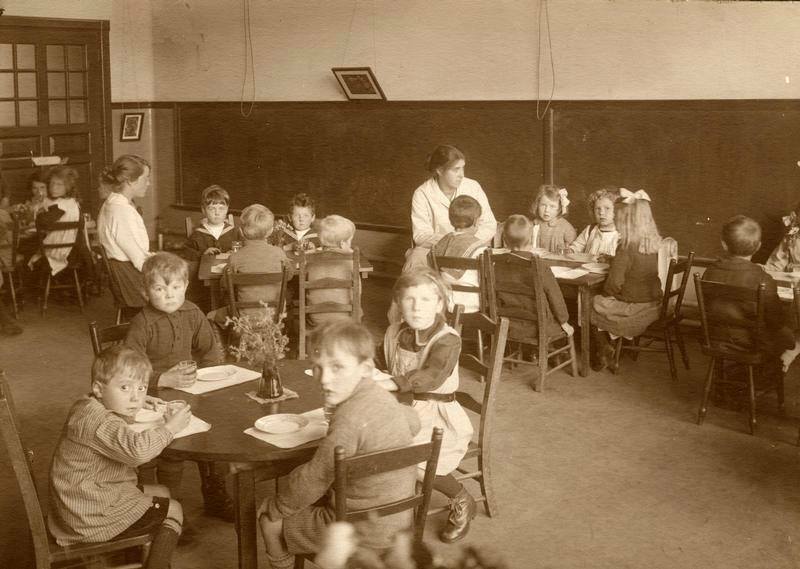 The kindergarten of New Earswick school are pictured here at their lunchtime. The teachers pictured here are thought to be Miss Pritchard and Miss Ashford. 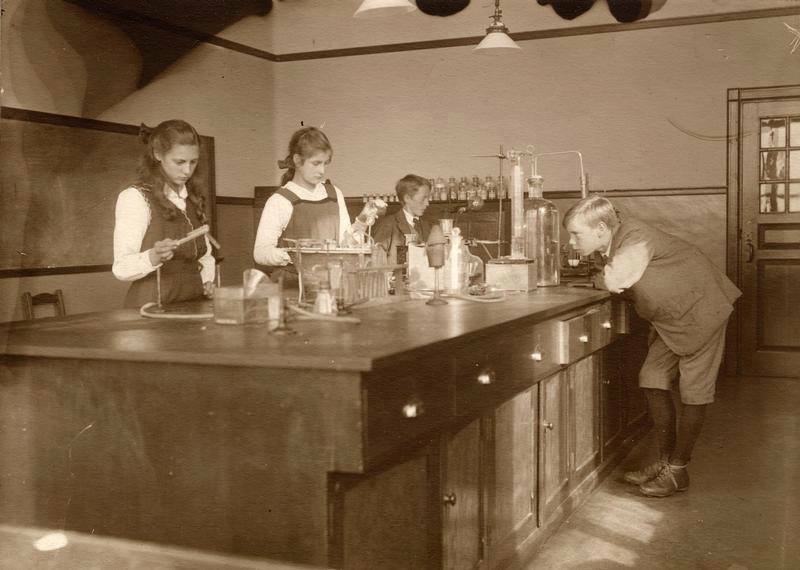 These four children are pictured in the science room at New Earswick Primary School in 1917. They are Edith Neal, Doris Powell, Cyril Charlton and John Skelton (from left). 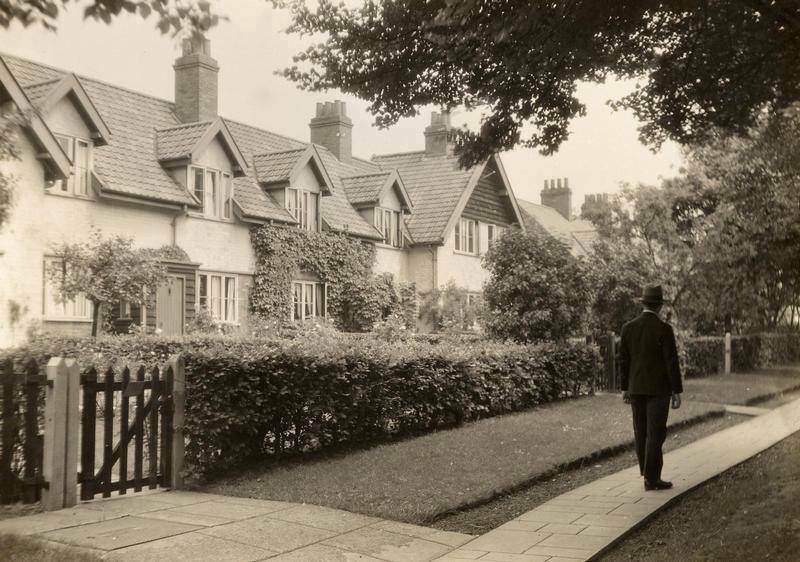 Joseph Rowntree’s plans for the model village of New Earswick meant that houses were built in terraces of uneven lengths. They were designed to provide the maximum amount of living space for a minimum rent. Originally the outsides of the houses were colourwashed but the Rowntree Village Trust abandoned this in 1904. 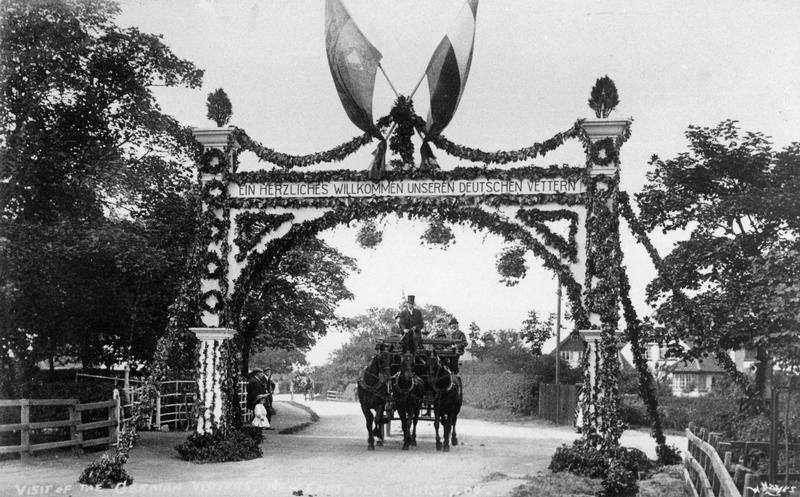 This image shows the street decorations which were created in New Earswick to celebrate the visit of the German Garden City Association. The visit generated much civic ceremony in York – William Hayes sold 36 dozen copies of the postcard of this view. These houses, nos. 1, 3, 5 and 7 Station Avenue, were built in 1905. The first tenants, in 1906 were, at no. 1, Mr Pattie and, at no. 5, Mrs Jageer, her sons Edgar and Cyril and Miss F. Patterson. Once a year a barrier was placed across the entrance to Station Avenue to maintain legal privacy of access. On that day, the 1st of June, anyone wishing to pass with a vehicle had to pay a toll of 1d. This was because the avenues were private roads. 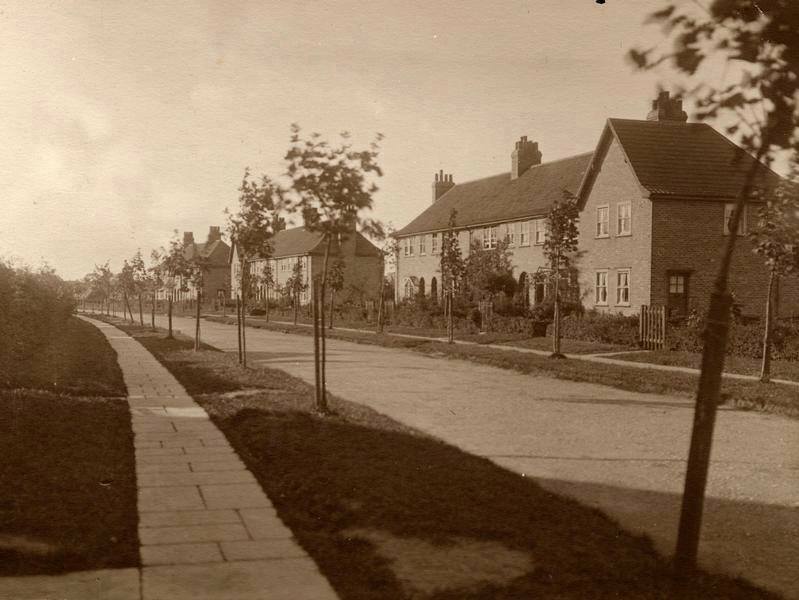 New Earswick shops, when they were first built in the ’40’s. Fascinating to see these pictures of the Folk Hall in New Earswick. I had my wedding reception there in December 1956. 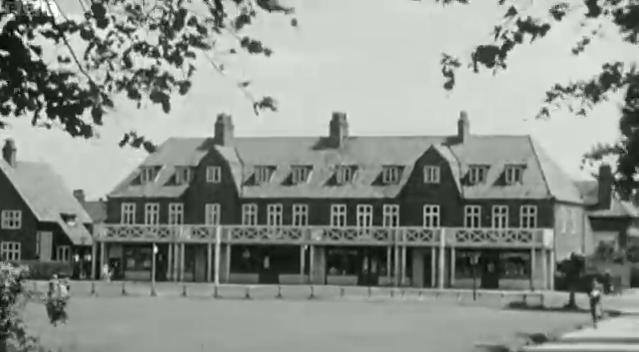 I also attended the Primary school 1939-45 and remember walking to the Folk Hall for classes during the war when New Earswick was home to many evacuees from Hull and Middlesborough. 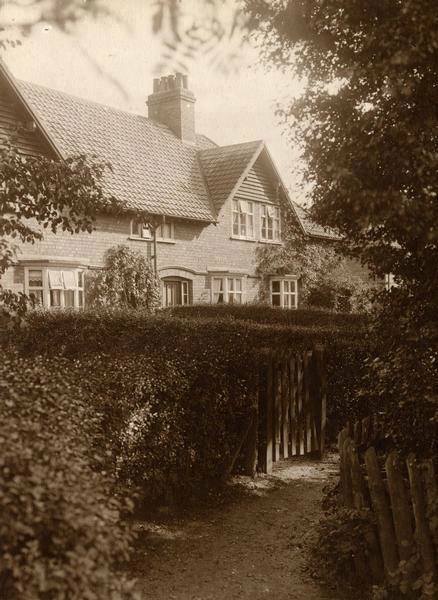 Wonderful to find that my home was built in 1908, lovely houses, grade 2 listed, and which thoroughly deserve to be looked after.